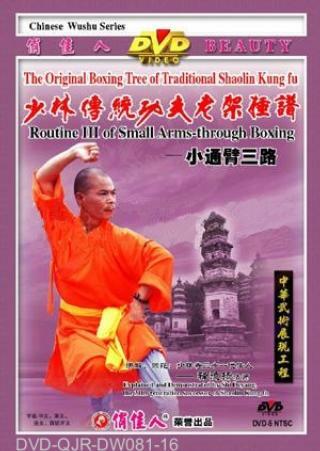 Shaolin Small Arm-through Fist (Shaolin Xiao Tongbi Quan) was created and arranged by the Shaolin Wushu monks by absorbing the advantages of Small Hong Fist (Xiao Hong Quan), Big Hong Fist (Da Hong Quan) and Monkey Fist, etc. It characterised as small and exquisite, lively and chipper. Hand-form is mostly monkey's claw with movements such as grasp, bounce, jump, turn and shrink often used, so it has another name called Arm-through Monkey Fist. This routine is lively and agile, and a good exercise for body joints. It is therefore not only to train you for fast forward and backward attack and defense techniques but also a good body exercise. It is very popular among kungfu lovers and suitable for teenagers.